Welcome to my first of 32 stories previewing the home schedules of every NFL team -- I finished the road slates earlier this week. Thus by the time I complete the home versions, we should be just a couple of weeks from the regular season. Of all the division winners in the NFL last year, I'd have to say Washington was the most surprising, just ahead of Minnesota. After all, Washington was last in the NFC East in 2014 with a 4-12 record and everyone was calling for Coach Jay Gruden's head after the one season. Gruden made a very unpopular decision among most Redskins fans in essentially demoting former franchise savior Robert Griffin III to third string entering last season. But it turns out this Gruden guy knows a little bit about quarterbacks. 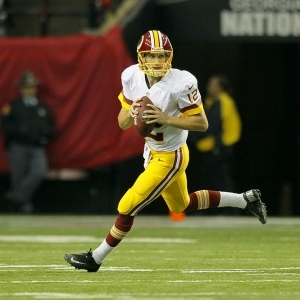 Kirk Cousins, who was drafted three rounds after RGIII in 2012, had the season of his life in throwing for 4,166 yards and 29 touchdowns while leading the NFL in completion percentage at 69.8. If you saw that coming, you are lying. Or your last name is Cousins. That stellar season obviously made Cousins the quarterback of the future for this team and the Redskins slapped the franchise tag on him while kissing RGIII goodbye. They are going to make Cousins prove it again before giving him a long-term deal, and I believe that's the smart move. There's a reason this guy was a backup his first three seasons, and Cousins has had major turnover problems in the past. His home/road splits were startling in 2015. Cousins completed 74.7 percent of his passes with 16 TDs, two picks and a rating of 117.0 at home. On the road, he completed 65.4 percent with 13 TDs, nine picks and a rating of 87.7. The team got Cousins some receiving help in this year's draft by taking TCU's Josh Doctson in the first round and I believe he has a realistic shot at NFL Rookie of the Year honors. He's +1500 for that. Washington was 6-2 at home last season, 5-3 against the spread and 3-5 "over/under." The Redskins play four home games against 2015 playoff teams. Their overall schedule is ranked as the 17th-toughest in the NFL with an opponents' combined 2015 winning percentage of .492. Washington has an over/under of 7.5 wins, with the over a -120 favorite. I'd go under. The Skins are +300 to repeat as NFC East champions, and I don't see that happening. Odds listed below for the home team. Sept. 12 vs. Steelers (+3, 50.5): This is the first game of the Week 1 Monday night doubleheader. It also has one of the highest totals of the first week. It will be the Washington debut of Josh Norman, the former Pro Bowl cornerback of Carolina. He no doubt will be guarding Steelers superstar receiver Antonio Brown. The Skins have dropped five straight in the series. Key trend: Skins 1-5 ATS all time at home vs. AFC North teams. Sept. 18 vs. Cowboys (pick'em): Dallas hosts the Giants in Week 1. This will be the return to Washington of running back Alfred Morris, who left in free agency. Although Morris, who once looked like a rising star with the Skins, will be no better than a backup to rookie Ezekiel Elliott. Washington was upset by visiting Dallas 19-16 last year, the Cowboys' only win without Tony Romo. You may remember DeSean Jackson's bone-headed fumble on a punt return deep in his own territory late in that Monday night game. But the Skins would still tie it -- on a Jackson TD reception -- before allowing a game-winning field goal with nine seconds left. Cousins threw for 219 yards and a TD. Key trend: Skins 6-4 ATS in past 10 at home in series. Oct. 2 vs. Browns (-7.5): I believe Washington could be 0-3 entering this game as it's off a trip to the Giants in Week 3. Cleveland almost surely will be 0-3 and comes in off a trip to Miami. But this game will get a lot of coverage even if both are winless as RGIII returns to D.C. as Cleveland's starter if healthy. I actually think he will mostly be cheered, not booed. Injuries ruined the guy, it was really nothing he did. Key trend: Skins 2-8 ATS in past 10 at home as at least a 7.5-point favorite. Oct. 16 vs. Eagles (-3): Washington off a very short trip to Baltimore in Week 5. Philly is in Detroit the previous Sunday. The Redskins are looking for their first four-game winning streak in this series since 1985-87. Last year at home, Washington won 23-20 in Week 4. Cousins led a game-winning 90-yard drive and capped it with a 4-yard TD toss to Pierre Garcon with 26 seconds left. Cousins' last three completions went to Garcon for a total of 32 yards. Key trend: Skins 5-5 ATS in past 10 as at least a 3-point home favorite in series. Nov. 13 vs. Vikings (+1.5): Redskins are off their bye week. Minnesota hosts Detroit in Week 9. What's interesting here is that both head coaches -- Washington's Gruden and the Vikings' Mike Zimmer -- are former Bengals coordinators. In five career games against the Redskins, Vikes running back Adrian Peterson has just one 100-yard game. Key trend: Skins 3-7 ATS in past 10 after bye (any location). Nov. 20 vs. Packers (+2.5): Sunday night game. Green Bay is off a trip to Tennessee. These teams met at FedEx Field in last year's wild-card game and the Packers won 35-18. Washington jumped out to an 11-0 lead but then was overwhelmed from the second quarter on. Cousins was 29-for-46 for 329 yards. He threw for one touchdown, ran for another, lost one fumble and was sacked six times. Key trend: Skins 5-5 ATS in past 10 at home vs. NFC North teams. Dec. 19 vs. Panthers (+5): Monday night game. Washington off a three-game road trip that concludes in Philly in Week 14. It's Redskins' third straight home game vs. a 2015 playoff team. Carolina is off a home game vs. San Diego. The Redskins were blasted 44-16 in Charlotte in Week 11 last year. The Skins turned it over five times, Cousins was sacked five times and they rushed for 14 total yards. Key trend: Skins 4-6 ATS in past 10 at home vs. NFC South teams. Jan. 1 vs. Giants (TBA): As usual, no Week 17 lines with too much potentially up in the air on the final Sunday. Washington is off a trip to Chicago on Christmas Eve. New York is in Philadelphia in Week 16 in the final Thursday night game of 2016. The Redskins beat the visiting Giants 20-14 in Week 12 last year. Cousins threw for 302 yards and a score and rushed for a TD. Key trend: Skins 4-6 ATS in past 10 at home in series.